Fast, courteous and inexpensive towing and roadside assistance in New York and New Jersey. Welcome to Big Tows Inc. founded in 1998 by Ricardo Fijor in Spring Valley New York. Big Tows Inc is one of the largest family owned towing company in Rockland County representing Michelin USA and Bfgoodrich. We are a New York State Authorized Repair facility for medium and heavy duty trucks. Our world-class service department experts are equipped with the skill and state-of-the art facilities to diagnose, repair, and maintain your units. Full service Truck and trailer Repair shop. Computer diagnostic. New York State Diesel emission testing and heavy truck and trailer inspection. 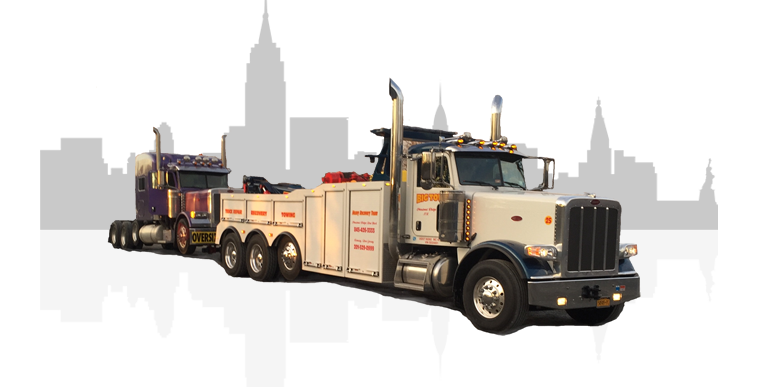 We provide Towing, Recovery, and Truck Repair services on Route 17, Route 287, Route 80, and Palisades Interstate Parkway . Big Tows Inc. provides emergency services for commercial vehicles on the New York State Thruway. Big Tows Inc. is one of the largest family owned towing company in Rockland County representing Michelin USA and Bfgoodrich. We are a New York State Authorized Repair facility for medium and heavy duty trucks.